The Japanese Red-Crowned Crane is a bird whose body and wing coverts are white, as is the top of the head except for the red crown. The neck and tail are black. They prefer to nest and feed in marshes with relatively deep water, building their nests in areas with standing dead vegetation. Mainland populations migrate across NE China, dividing into 3-4 wintering sub-populations. A nest of reeds and grass is built in relatively deep water, up to 20 inches deep. They will only nest in areas with dead standing reeds 12” to 78” tall. Chicks are brown with a white spot at the base of the wing. Fledging is in about 95 days. Japanese Red-crowned Cranes are classified as Vulnerable. They are the second rarest crane, with current population estimated at 1700 to 2000 birds. They breed readily in captivity, and captive-raised birds have been released into the wild at three natural breeding sites. 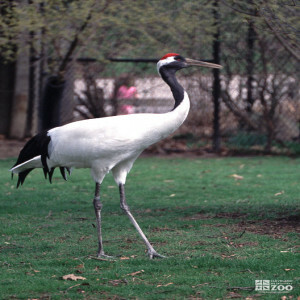 The range of the Japanese red-crowned crane is Japan, China, Russia, and Korea. In summer, Japanese Red-Crowned Cranes can be found in marshes, bogs and wet meadows. In winter they are found by rivers, freshwater wetlands, salt-marshes, mudflats, and paddyfields. Japanese red-crowned cranes incubate their eggs from 29 to 34 days. Japanese Red-Crowned Cranes prefer to nest and feed in marshes with relatively deep water, building their nests in areas with standing dead vegetation. Birds from the west migrate along the Northern China Sea to coastal wintering areas in and around Jiangsu. Japanese populations are essentially sedentary: some family groups remain in breeding areas, and others move to wintering areas near Hokkaido. Breeding is in the spring for Japanese Red-Crowned Cranes with eggs laid mainly in April, but sometimes in May. A nest of reeds and grass is built in relatively deep water, up to 20 inches deep. They will only nest in areas with dead standing reeds 12” to 78” tall. Chicks are brown with a white spot at the base of the wing. Fledging is in about 95 days. Sexual maturity is attained at 3 to 4 years. Insects, aquatic invertebrates, fish, amphibians, rodents, reeds, grasses and other plants.